Later, she visited a house in Telugu Nagar, a hamlet in the Thampalakamam village, and collected information regarding the non-school going children and dropouts, sources said. The house-to-house survey launched Thursday aims at improving available information and data, mobilizing the zonal offices to promote compulsory education, strengthening the attendance committee, raising awareness at the community level and ultimately to reduce the number of children not in school. In this project about 1500 students from Grade 11 and Advanced Level students will participate and about 300 school attendance committee members will be involved. Twelve co-ordination centres will be established for this activity and a school principal will be in charge of each centre. The non-formal unit of each education zone in the district is in charge of the activity, UNICEF sources said. 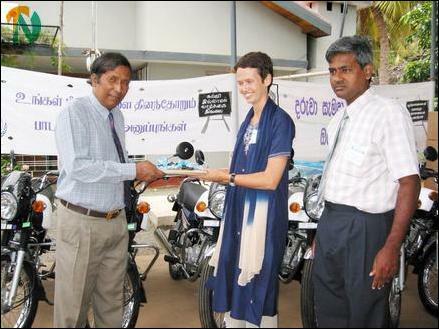 Later on Thursday, at a function held in at the UNICEF’s Trincomalee office, Ms.Elroy handed over six motorbikes to the North East Provincial Education Ministry Secretary, Mr.R.Thiagalingam, who in turn distributed the motor bikes -two each to the three education zones in the Trincomalee district, namely Trincomalee, Muttur and Kantalai. The motorbikes are to be used by zonal education officials who are given the task of supervising the house-to-house survey under the “ Education for All” project, sources said. Addressing the event, Mr.Thiagalaingam said that the 20 years of war in the northeast province has prevented large number of children from attending schools due to mass scale displacement, poverty and other social ills. The UNICEF has come forward to identify those unfortunate children and to bring them to schools. Ms. Elroy stressed the urgent need for identifying the non-school going children and the dropouts and to provide education in schools." We are under immense pressure to implement this program," she said. Ms Gabrielle Elroy inaugurates the House-to-House survey under Education for all project at Tampalakamam-Puthukuddiruppu Tamil Vidiayalayam Thursday morning. 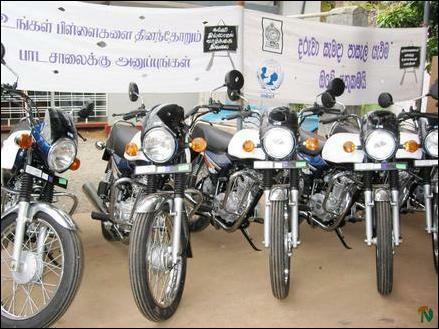 The six motor bikes donated by the UNICEF to NE Provincial Education Ministry under project " Education for all"